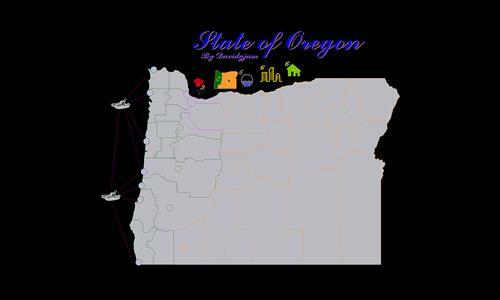 The state of Oregon with cities and sea routes. It's an attractive and well-conceived map. Unfortunately, the bonus structure makes it virtually unplayable. There need to be smaller and more numerous bonuses. As it currently stands, whoever captures the first bonus will likely triumph easily. Bonuses are too few and too hard to get, makes for a challenge, but not in a fun way, because the "rose" bonus was too easy to get and the rest where too hard it made for an unbalanced map. Review by It's me on 2/7/2017.